Govt spend on water resources is five times lower than on farmers’ credit, crop insurance. Of this, only 3% is spent on flood management. 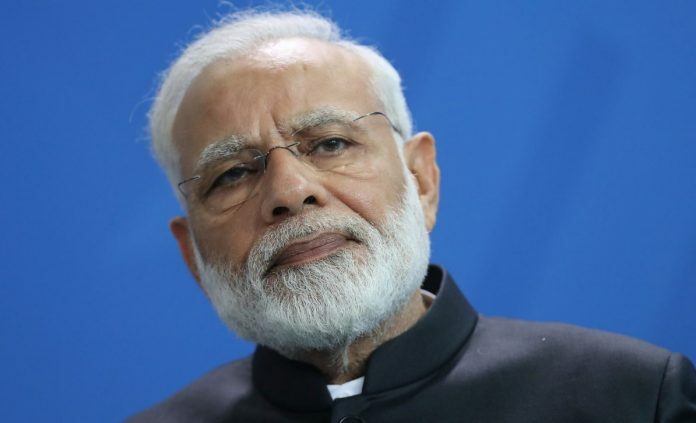 Pinning down the cause of the disaster is important in assessing Prime Minister Narendra Modi’s spending priorities as he heads into an election year. India’s budget certainly needs an overhaul. While the Kerala downpours were unusually heavy, most of the damage was done after the sluice gates of brimming dams were opened to release water into parts of the southwestern coast that were already on the verge of inundation. The flooding itself is no surprise: Almost 15 per cent of India’s land mass is prone to floods and every year, on average, as many as 2,000 lives are lost and up to 8 million hectares (20 million acres) affected, at a cost of 18 billion rupees ($258 million). Indian government agencies do investigate flood management and control, but the findings tend to gather dust. Last year, the Comptroller and Auditor General published a report for parliament that found that deficiencies in approving project designs meant most were out of date by the time funding was available. Of 219 planned telemetry stations, used to forecast floods, only one-quarter were set up. And of 375 existing stations, almost 60 per cent were “non-functional after installation,” the report found. There are huge holes, too, in a decades-old system of checks and balances. Every Indian state is supposed to submit to the central government an emergency plan for each of its large dams. These help predict areas that would be most affected by any break, and provide evacuation contingencies. Of almost 5,000 dams in India, only 7 per cent had such action plans. For the 61 in Kerala, there were none. Because the monsoon is an annual phenomenon, watched by everybody from central bankers to farmers, the National Water Policy requires dam checks before and after the rains. Those inspections only happened in two states in the most recent year. Worse, when defects were pointed out, they weren’t fixed. The relatively small sums allocated to spending on dams are either unused or channeled to unapproved projects. 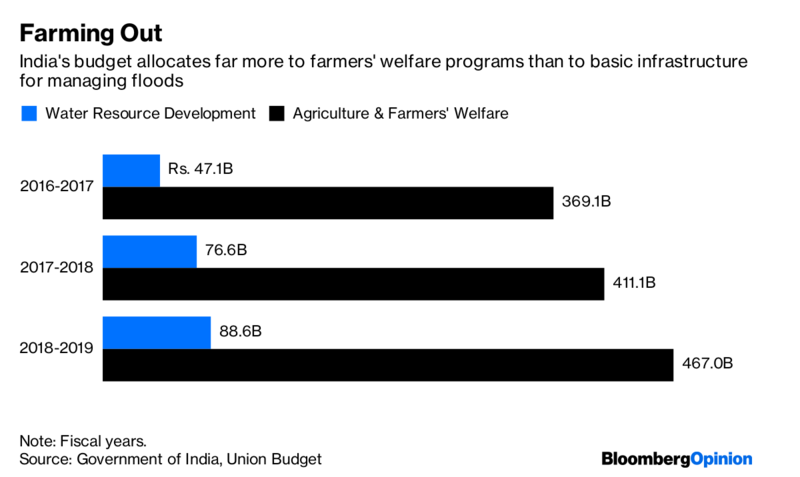 Tragic as the Kerala floods are, they help underline how Modi’s largess can divert spending from necessities like infrastructure toward populist causes, especially agriculture. For example, the national budget for fiscal 2018-19 pledges a minimum price for farm products that is 50 per cent more than the cost of producing them. The central government has forgiven billions of rupees of farmers’ loans in several states. All told, New Delhi spends five times more on items like subsidized credit to farmers and crop insurance than it does on water resources. Only 3 per cent of water spending is on flood management, and an even smaller proportion of that is in capital outlays. In this year’s budget, the government made no allocation at all for flood forecasting and management. The consequences of this neglect will broaden. In Kerala, the flooding is likely to wipe out many farmers and small businesses, and will hit banks’ ability to recover loans. Nationwide, banks’ exposure to the state is about 3 per cent of total lending, according to Jefferies analysts, though it ranges from 41 per cent for South Indian Bank Ltd. to 4 per cent or less for the likes of ICICI Bank Ltd. and HDFC Bank Ltd.
For all the talk of infrastructure spending increasing by one-fifth in the budget, new project announcements declined more than 20 per cent in the fiscal first quarter, led by an almost 80 per cent drop in the government’s portion — in turn a reflection of slowing completions of earlier projects. 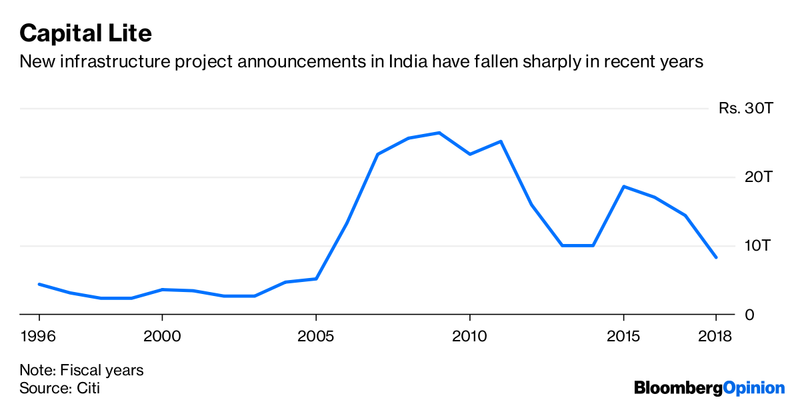 Institutional investors are pulling back, despite Modi’s globe-trotting roadshows when he was elected in 2014.